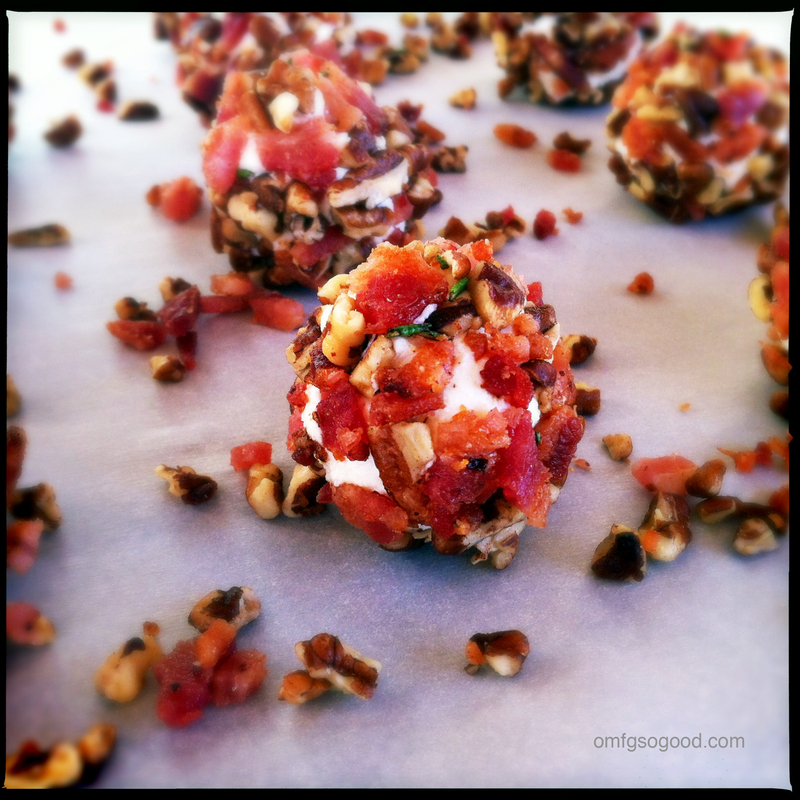 goat cheese mascarpone & honey truffles | omfg. so good. Sometimes a girl needs something other than chocolate. Sometimes a girl needs a creamy cheese based truffle. Sometimes a girl needs that truffle to be rolled in bacon. Sometimes, that girl is me. This was one of those ideas that hit me while meandering through the aisles of the local Fresh n’ Easy. I really had no reason to buy a tub of mascarpone, other than I saw it and thought it was something I needed to have. Same with the goat cheese. This seems to happen to me often at Fresh n’ Easy. Normally I end up with buyer’s remorse because those prepared meals that look so appealing on display, taste like paste covered pasta in my mouth. Maybe I need to tie a piece of yarn around my finger next time I go shopping to remind myself not to fall prey to the siren song of pre-packaged mac n’ cheese. Ah, the draw of a quick meal to a working mom. And as usual, I digress… Stay on track, Jenn. Goat Cheese. Mascarpone. Honey. Rosemary. Bacon. Roasted Pecans. 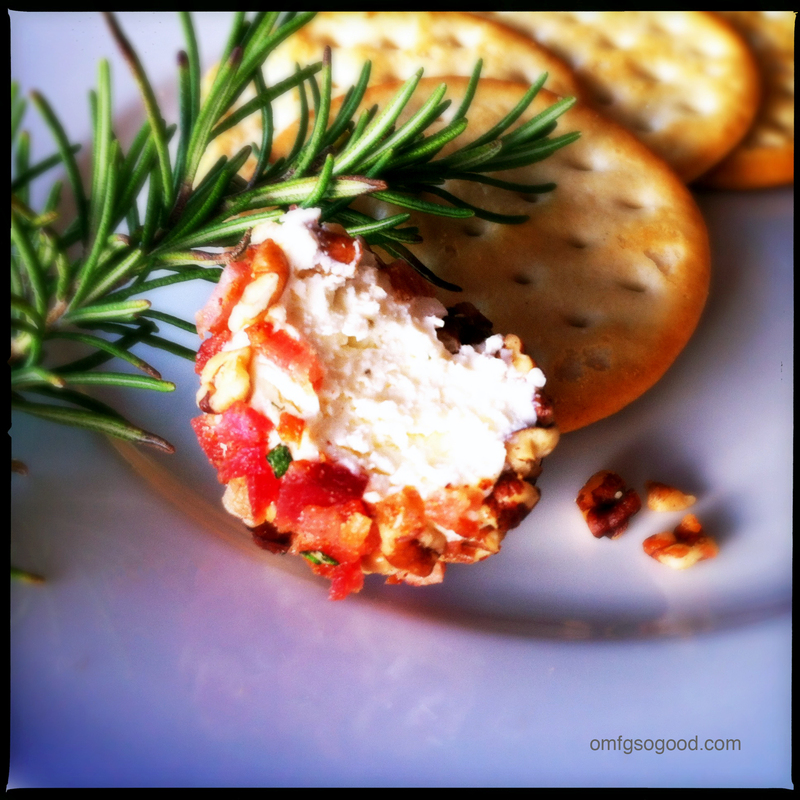 In a small bowl, combine the goat cheese, mascarpone, honey, salt and 1 tsp of the rosemary. Mix until combined, smooth and creamy. 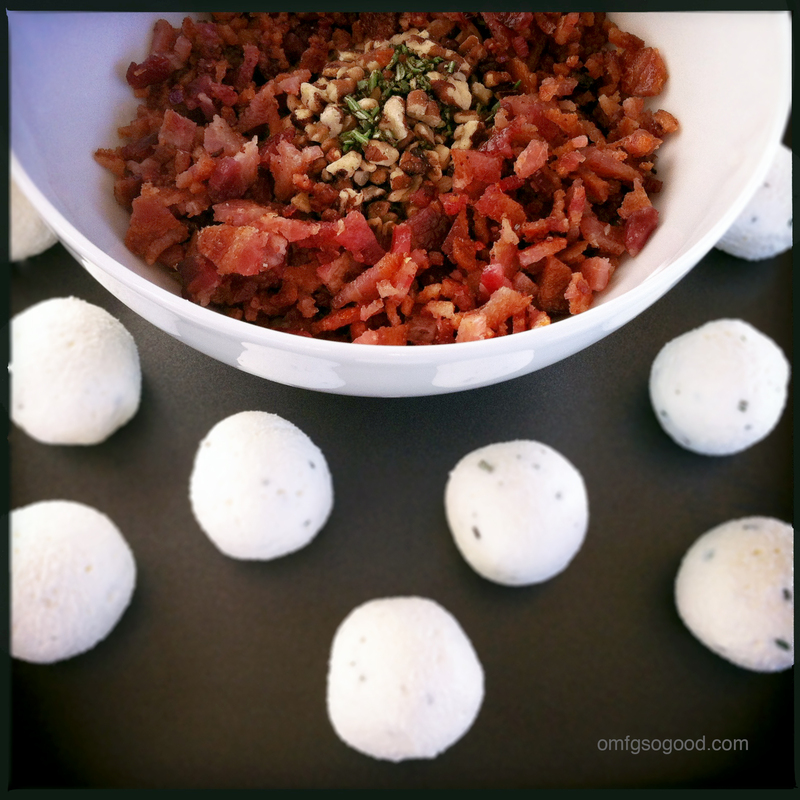 Roll the cheese mixture into truffle-sized balls and place on a sheet pan. Chill in the fridge for 30 minutes, or so, to set. Preheat the oven to 350 degrees. 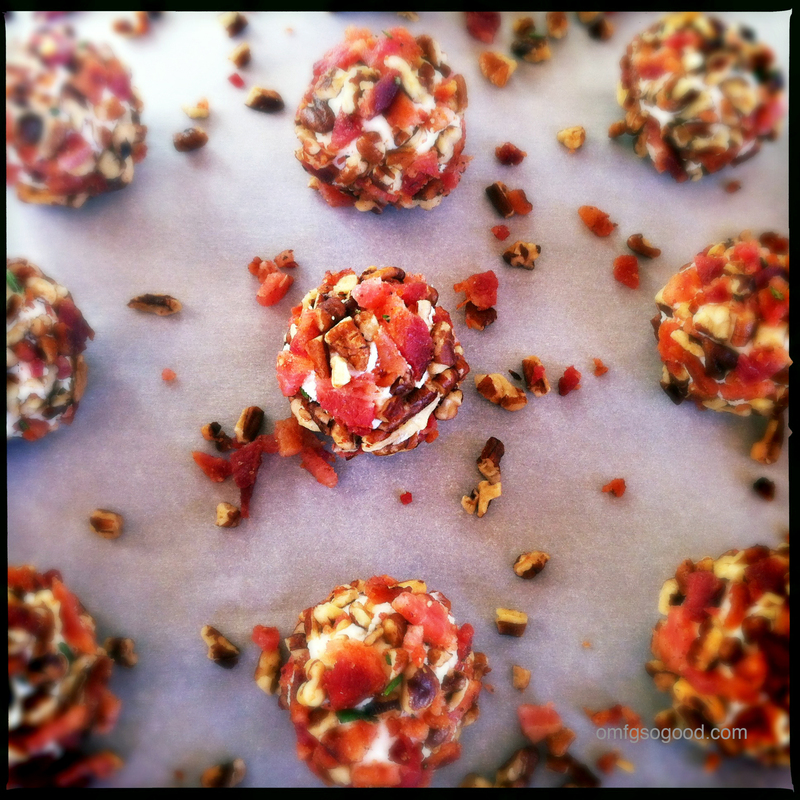 Line a small sheet pan with parchment paper and spread the chopped pecans in a single layer. Roast in the preheated oven for 8 – 10 minutes, or until they start to smell toasty and turn a golden brown. 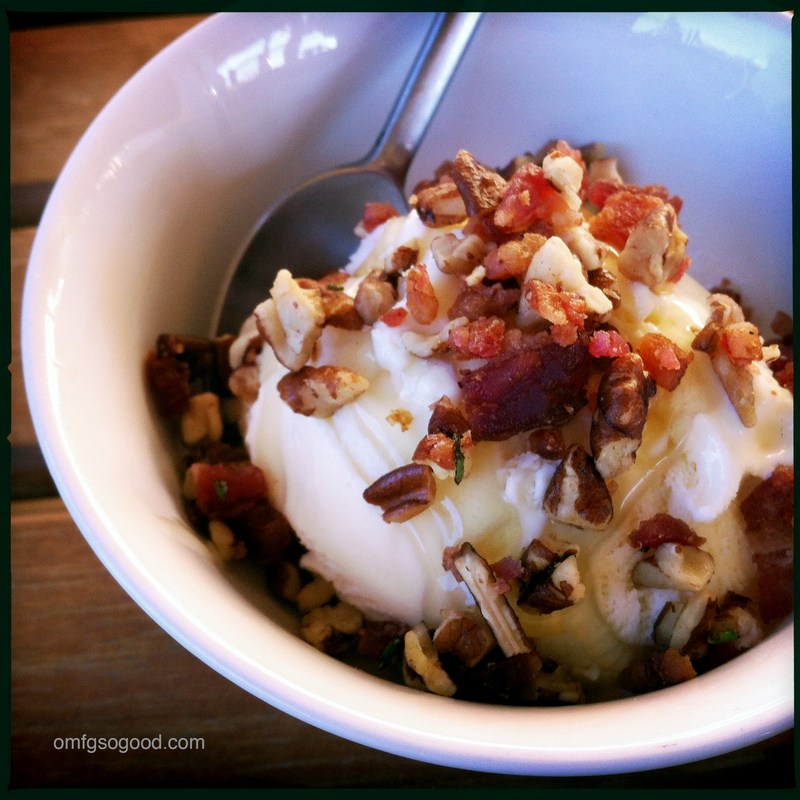 In a small bowl, combine the cooked, chopped bacon, roasted pecans and remaining 1 tsp rosemary, then toss to mix. 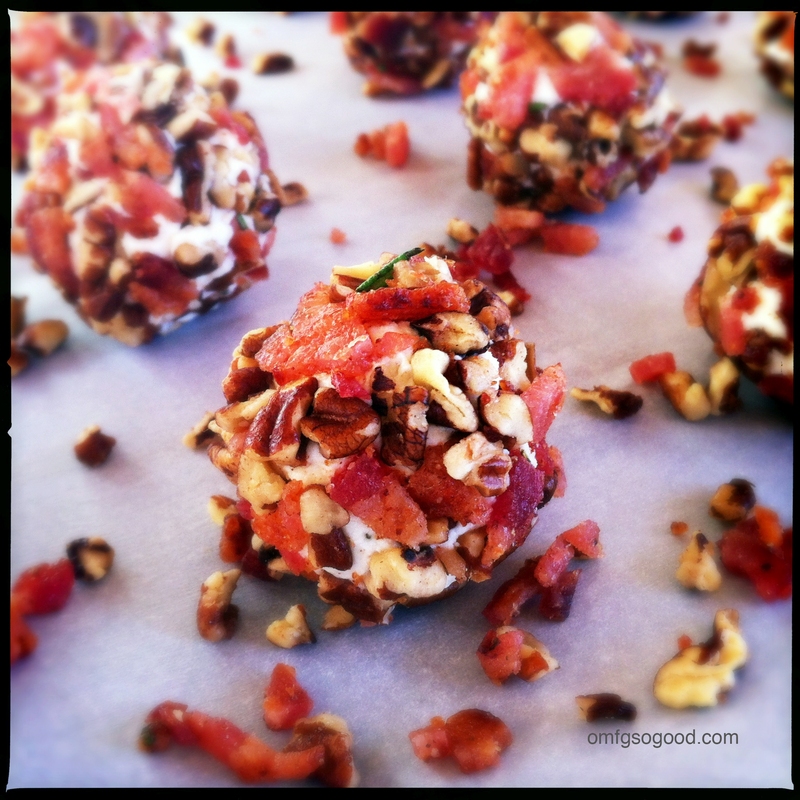 Roll the chilled cheese balls in the bacon/pecan blend, return to the sheet pan and chill until ready to serve. These pair nicely with a simple cracker, and would be insanely good with warmed slices of mini-baguette. Let me just tell you, once I started eating these I couldn’t stop. Jonny and I were throwing elbows at the counter over them. He won. (His elbows are much pointier than mine.) But I did manage to inhale around five of them. Holy Hell. Two awesome ideas in one day, and no buyer’s remorse. Sometimes I amaze myself. Drooling, thanks! Will be doing these for gifts! I swear, every time I come across your posts in my reader, I either say out loud, “What IS that”, or, “OMG…”. (All in a really good, yummy, I want that NOW kind of voice). The title of your blog, is no joke. OM*G this looks so good! Wow.